The embattled top lawyer at the South Florida public hospital system was reportedly fired by its board Wednesday following public accusations that she failed to sign contracts on time and funneled millions of dollars to outside law firms. 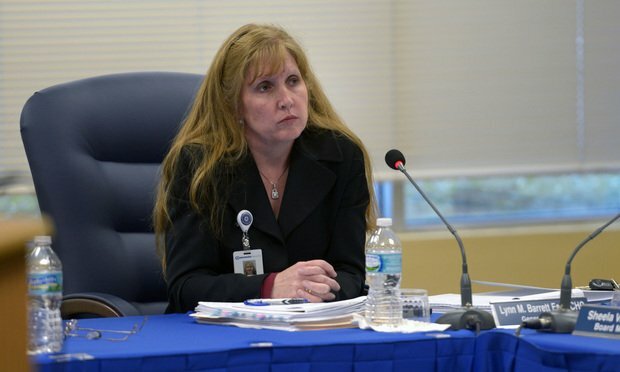 Broward Health general counsel Lynn Barrett as North Broward Hospital District holds a special board meeting on Feb. 10, 2016, to discuss pending investigations. The general counsel at a South Florida public hospital system was fired Wednesday following public accusations that she failed to sign contracts on time and funneled millions of dollars to outside law firms, according to a Sun Sentinel account.